The E-PDD part number has been replaced by FX-PDD. Products are otherwise identical. Labor-saving Remote Test/Reset stations provide alarm testing from the convenience of a remote location. Tests can be performed quickly and safely – without having to climb to the roof. Magnetically-operated and key-operated one-gang models are available. 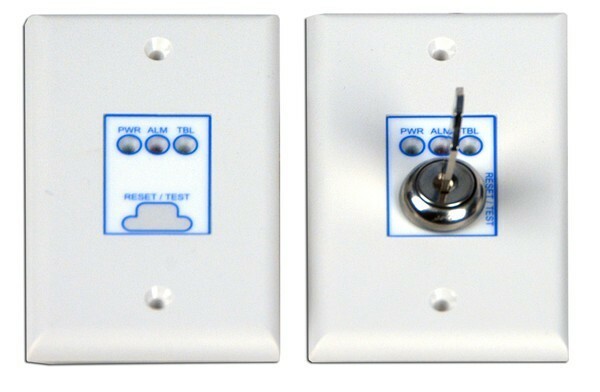 FX-PDD detectors are also compatible with R-LED remote alarm LED. Air velocity in the duct as low as 100 ft/min. maintains adequate air flow into the sensor smoke chamber through air holes in the air sampling tube and discharges through the exhaust tube. Air sampling tubes must be installed with the inlet holes facing the airstream. Sampling tubes may be rotated in 45-degree increments so that air-holes can be aligned to allow the unit to be mounted in virtually any angle relative to the airflow. FX-PDD sensors are engineered to operate optimally under the harsh environmental conditions frequently found in HVAC ductwork. Nonetheless, before installing the detector, test the duct air velocity, temperature, and humidity to verify that it is within the operating range of the detector. Consult the FX-PDD installation sheet for details. Remote Test/Reset Stations provide alarm test, trouble indication, and reset capability from a remote location. 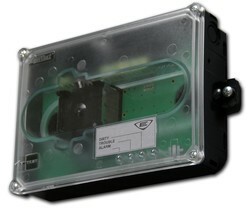 They include a one-gang plate, momentary SPST switch, red alarm LED, and terminal block. Magnetically-operated models (TRM) or key-operated models (TRK) are available. Resistance per wire: 10 Ohms, max. LED circuit ratings: Voltage: 3 Vdc, max. Current: 30 mA, max. Switch ratings (SD-TRK): Voltage: 125 Vdc, max. Current: 4 A, max. Switch ratings (SD-TRM): Voltage: 200 Vdc, max. Current: 0.5 A, max. This bulletin announces the replacement for the E-PDD addressable duct detector.